Speaking about the song, Ash King said, “The song has been brilliantly composed by Qaran. It promises to instantly elevate one's mood and take them down the lane of romance. Kishmish also has a very new and refreshing touch to it, which we're hoping will be loved by everyone. I thoroughly enjoyed recording the song and hope to collaborate with the team again in future." “After the huge success of Tareefan, I'm really excited about the release of my new song Kishmish with Times Music. Both Ash and Momina have sung it so beautifully that the song is stuck in my head and I just can't stop humming it. I hope our audience appreciates our efforts and showers their love to the song just like they've done in the past,” says composer Qaran Mehta. Featuring Qaran Mehta alongside the hot Vartika Singh, who is the former Miss India Grand International 2015, the song is a sizzling romantic number, staged at a wedding party, where the duo are smitten by each other. Qaran and Vartika’s chemistry is an icing on the cake for the equally sensual vocals by Ash King and Momina Mustehsan, who voice will make you fall in love. The beautiful lyrics are penned by Qaran along with Siddhanth Kuashal. Qaran’s music compositions are equally soothing and the blend of R&B and afr-beat adds to this romantic number, which has a Punjabi touch. Qaran has totally slayed as actor, composer and lyricist with Kishmish. Momina’s voice is also fantabulous and her vocal chemistry with Ash King is phenomenal and comes out beautifully in the song. 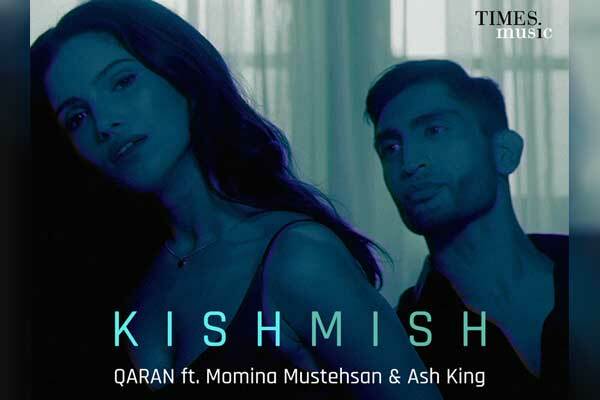 Meanwhile, Kishmish, which is also available on Gaana app, has garnered over million views since it dropped online. We are sure that this song is going to be on repeat mode on everyone’s playlist.